See the top Cultural trips that go through Israel and Jordan. With 95 tours to choose from, they range in length from 3 days to 22. The most popular month for these tours is November, which has the most departures. "Driver of bus spoke loudly on his phone the whole trip overpowering the guide. We..."
"I enjoyed the tour and had a great time." "Amazing tour. Jordan was a highlight with an exceptional guide (Faisal) who made..."
"Our guide for Jordan Tour, Suhaib was fantastic! - he was very organised and knowledgeable...."
"We found the trip very good, however, the itinerary needs looking at as there were..."
"Israel and Jordan were fascinating. Both Jalal (Israel guide) and Zuhair (Jordan..."
"Better scheduling of itinernary would have allowed us to take in the options available..."
"the tour is organized well, all the customer service is excellent. Only thing I wish..."
"Excellent tour! I have already recommended it to few friends." "I signed up the 12 day Israel / Jordan / West Bank full experience package tour in..."
"The trip was varied and insightful. 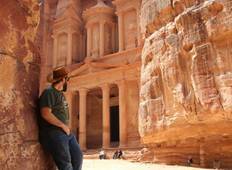 We arrived a few days before and departed a few..."
"Best experience was Petra, Bedouin desert camp."